Film damping often occurs in microsystems when a released (or freely moving) structure is separated from the substrate (a larger structure that is stationary) by a thin layer of gas. When the released structure moves, flow occurs in the thin layer of gas and the resulting energy dissipation produces damping. In squeezed film damping, the released structure moves so that the gap between it and the substrate expands and/or contracts. When the gap contracts, the gas film is squeezed between the two surfaces. In slide film damping, the released structure moves parallel to the substrate, leading to shearing within the gas film. In general, the motion of the structure can result in a mixture of both squeeze and slide film damping, but in practical devices it is often the case that one process dominates. By dissipating energy from the moving structures, the film results in a damping effect in both instances. While film damping can be an unwanted occurrence, it can also be used as a mechanism for controlling the transient operation of a component. The Reynolds equation can be used to analyze the fluid dynamics of thin films of gases or liquids between two moving surfaces. This partial differential equation focuses on the relationship between lubricant pressure and its dependence on the thickness of the flow film, the local fluid velocity, and the velocity of the surfaces. The Reynolds equation assumes that the fluid film thickness is small compared to the other dimensions of the device. Many MEMS accelerometers measure the displacement of a microstructure separated from a substrate by a thin gap. The released microstructure moves closer to or farther from the substrate when the whole device undergoes an acceleration. As a result of the motion, the gas film is squeezed, resulting in a damping force. When the two surfaces move away from one another, the opposite effect occurs. The pressure of the gas can be adjusted by sealing the accelerometer in an enclosed package. The gas pressure is chosen to ensure that the damping that acts on the accelerometer is close to critical damping. In other words, the microstructure responds to a change in acceleration as fast as possible without oscillation. The fluid pressure exerted on the surface of a vibrating disc. 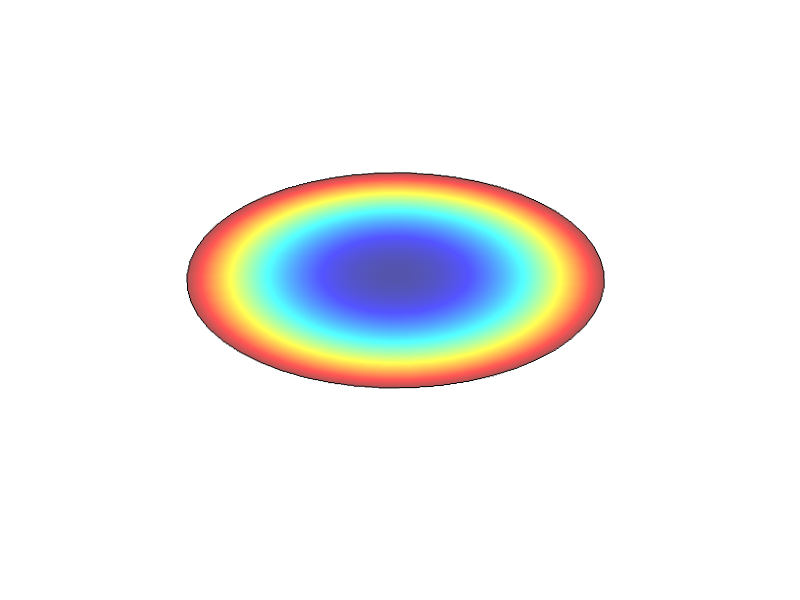 The figure above shows the pressure that develops underneath a disc structure that is moving away from the substrate.